Stuffing? Oh, I think NOT! Only dressing will do! There is no real recipe to this dressing! We just watched Mama make this every year of our lives and we do it like she did. We make a good pan of cornbread, crumble it up along with a loaf of French bread, add onions, celery, all the seasonings, and homemade chicken broth till it "looks" right. We taste for seasoning, then crack and add eggs till it "feels" right. From here, it can be popped in the freezer for later or in the oven for now! It comes out perfect every time. It is delicious served next to Turkey, Ham, Roast Beef or Chicken, not just on Thanksgiving, but for any time of the year! Serve it with homemade giblet gravy and cranberry sauce. Mmmmm...I can eat my weight in this stuff! Here, we use another ancient family recipe for Chicken and Dumplings. Made from scratch according to our Aunt Hermia's (how about that name??) recipe. Chicken is stewed down, till it is falling off the bone, in a huge pot of whole celery stalks, whole onions, salt and pepper. The chicken is then shredded and the vegetables are removed from the pot, leaving a wonderfully flavored broth. Then are added the homemade, hand-rolled and cut dumplings. Put a bowl of these in front of me, with some hot buttered cornbread and a fresh garden salad to nibble on, and I am apt to make a fool of myself! Click the order button to get you some...we'll all just be fools together! What's Life Without Sweet Potato Casserole? Ya' gotta' have it!. Oh, the smell of it cooking...it drifts throughout the house making it smell downright dreamy. Our Sweet Potato Casserole is rich with baked sweet potatoes, butter, brown sugar, cream, and a couple of secret ingredients (we could tell you, but then...you know...). It can be popped into the oven or in the freezer till you get ready for it. 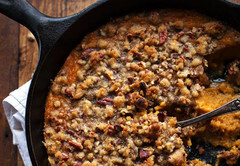 We top it with a delicious pecan-brown sugar topping that gets crunchy-soft as it cooks. Homemade goodness shows through with the first bite of this traditional casserole. This is one loaded potato!! Fresh baked potatoes mashed and mixed with cream, butter, grated cheddar, sour cream, salt and pepper then baked to a golden perfection and topped with lots of bacon, more cheese, and fresh chopped green onions. This side dish will throw your comfort food meal over the top. This casserole is made from our grandmother Ubba's recipe. It contains toasted onions, homemade seasoned and buttered bread crumbs, mushroom soup, cheese, some great "grandma" seasonings, along with salt and pepper. 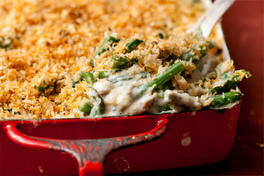 It is topped with cheese, more bread crumbs and toasted onion rings. All I can say is that Ubba was asked to cook this casserole every holiday season throughout the 20th century. Literally. And there was never a bite left over! Classic goodness, period! From scratch, Zeus' recipe...enough said. Holy cheesy moly! Yum! 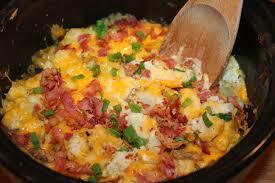 This casserole is nothing short of awesome! The rather labor intensive recipe was handed down from two generations back to me by my sweet mother-in-law. 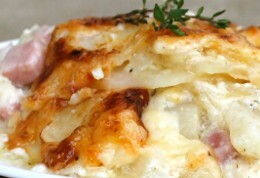 It starts with very thinly sliced potatoes and onions, and layering them with baked ham. 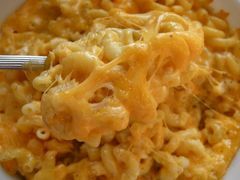 A cheese sauce made with Cheddar, cream, butter, milk and secret seasonings is poured to smother the layers and then it's popped in the oven and baked to a bubbly, creamy, cheesy, golden brown. There, seriously, are no words to describe just how delicious this concoction really is. 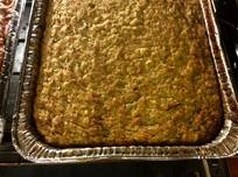 This casserole is prepared according to our mother's squash casserole recipe, which is not really a recipe at all! She always said "eyeball it!" One day, I suppose we should "eyeball it" and write it down! Even though I can't tell you exact measurements of this recipe, I can tell you it is divine. 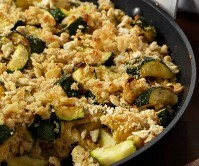 It contains layers of fresh sliced yellow squash and zucchini, fresh from my garden, sliced onion, homemade seasoned and buttered breadcrumbs, cheese, and seasoned egg and milk mixture that makes this casserole to die for! Central Grocery Muffuletta (4 pieces), 1 quart of our New Orleans Red Beans and Rice,1 quart of Zeus' Seafood Gumbo, 1 quart of Cajun Potato Salad, 6 pc Cornbread, and 2 quart of Bread Pudding with Whiskey Sauce.